If you haven’t noticed I take A LOT of self portraits. Usually about 2 a week. They can range from something silly like food flying out of my fridge at my face to a little more out there with a photo of me climbing a gift boxes or having snowball fights with snowmen. 2 photos a week. It may not sound like a lot but when you think about all the prep that goes into an image, the task can be pretty large. Usually it all starts with brain storming ideas. I remember when I started doing these, my original plan was to pick two words from a jar and make an image out of those two words. I found that it was difficult as I needed more time to plan things. If I needed a prop for the image I needed to be able to get it for the shoot itself and to have a successful image. I then moved to a list of ideas that I had of things I just thought would be cool. Things like driving the car pieces around a monopoly board or being really tiny and climbing up table legs. My list is pretty long and I have a feeling it will just keep getting longer as little things tend to inspire me. I will say that it is super hard to take a good self portrait sometimes. Making sure your camera is in focus and positioned correctly to the angle that you want your photo taken can be quite challenging. Especially when you’re not there behind the camera. Generally it is a lot of guess work. Set camera up try and get the right focus, set timer, run to spot, take photo and run back and make sure it was correct. There are really many ways to do it but being able to see what you’re doing is really the best way and mostly not an option for me. A lot of the time things will come out out of focus, blurry or just out of frame. It’s mostly when I’m trying to do something that is a little harder of an angle like this years Macys Thanksgiving day parade image. Even the position was difficult for that one. A lot of ab work haha. 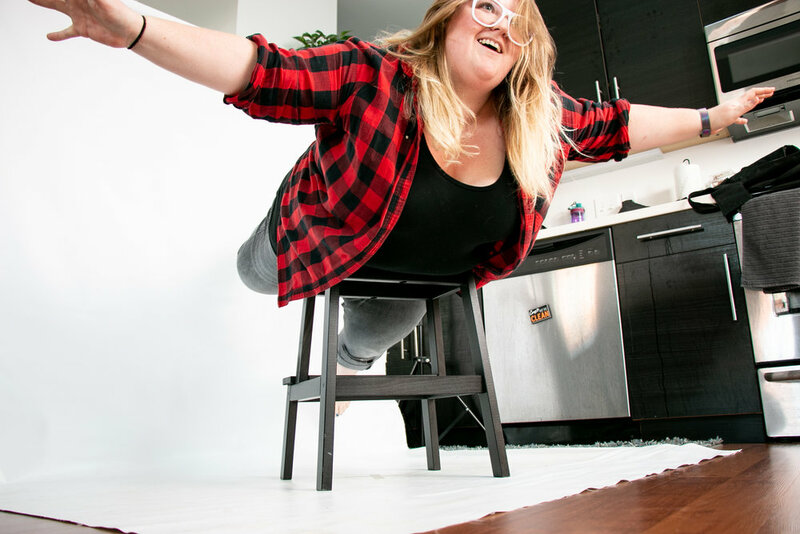 I remember after that I was pretty sure I worked off a lot of calories from basically planking through each shot on a 10 second timer for each one. I do love the editing part through. It has always been my favorite part of doing photography. I know a lot of photographers really love the behind the camera time and hate editing, usually sending it out. But not I! Something about being able to change things and make things look real/not real or just make it how I want it really does it for me. In this particular example I was trying to make myself look like a big inflatable balloon. That meant that the image had to be shot looking up at me because that is how you view balloons in the parade. My goal was to make myself look as plastic/shiny as I could without losing details of my body and skin. I also needed to make strings, a lot of them, so it looked like I was being pulled down the street. To create height, I added the tops of trees and an apartment building to give the effect that I was soaring high. Even tough these images are a lot of work, they are still really fun to make and come up with. I think doing self portraits are important for me as they grow my skills and present me with a lot of problem solving that I may not have otherwise had to do. It’s important to give yourself that sometimes. If you’ve seen my other images, what one is your favorite? Let me know in the comments below.